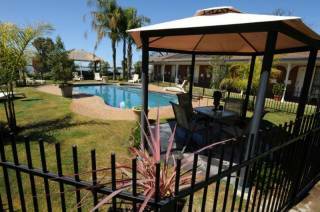 Carawah Holiday House is perfectly located in the heart of Mulwala and faces direct East, offering beautiful 180 degree views of sparkling Lake Mulwala. 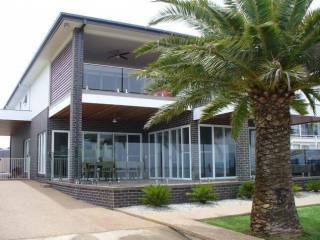 Guests can walk over the road to the supermarket, news agency, chemist and then just a short walk to the new wine bar, the Mulwala Water Ski club, the Mulwala Bakery and Hicks Butchers. This property is a comfortable family holiday home, offering loads of natural light, a solar heated pool, double carport and protected waterfront al fresco. Offering 4 bedrooms (3 bedrooms upstairs, one bedroom downstairs) this property can sleep up to 12 guests in 12 individual beds. Welcome pack of tea, coffee, milk and basic pantry items. Guests are required to bring their own pool towels. Rates are priced on a maximum of 12 guests. Charge to split queen beds into singles: $35/$70. Stay for 7, pay for 5 offer excludes November, December, January and peak periods.